Bohle has launched its new swing-door Self-closing Corner Fitting, which in eliminating the recess required to house traditional floor springs, trims installation time by half. The highly innovative solution replaces the conventional floor springs used in traditional internal swing-door self-closing systems with a cutting-edge hydraulic system. 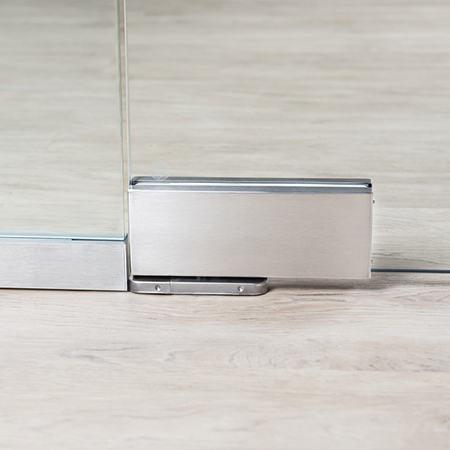 A new addition to Bohle’s Patch Swinging Door System, the new Self-closing Corner Fitting doesn’t need to be recessed and can be fitted in as little as 45-minutes, using just four screws to achieve a fixing to the floor, as part of a simple two-stage process. This delivers a significant on-site time saving compared to traditional installation techniques, including time lost for cement to cure. Also featuring simple and easy zero positioning of cover plates, the double action ‘push/pull’ system opens to 90° and features fully adjustable closing speeds. Suitable for use in buildings with a mid-range footfall and underfloor heating, the system is fully tested to 500,000 opening and closing cycles in line with EN 1154.